It was a day that I won't soon forget. This race meant so much to me in so many ways. It was a mental battle of being able to come back and conquer the race that just last year conquered me with a broken collar bone, but also because it was my daughter Payton's first 5k race. so I didn't accomplish much throughout the day. It also makes dinner interesting because we had to eat by a certain time and I didn't want to eat anything too heavy. We opted for Grilled Chicken Salad which turned out to be a good choice. ready in the picture to the right. heavy so I knew he was OK, but just in need of some mental and physical prompting. This continued, but he completed it and finished strong. He came in third overall and first in his age group. faster time and so the cards got swapped. Oh well..... we know! While we were waiting for the 5k to start my daughter, Payton, and I walked over to the spot where I was tripped last year and we had a moment of silence..... OK, I did, she just thought I was weird. 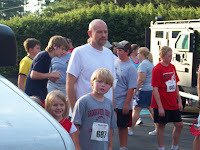 It didn't take long before it was time for the featured event, the 5k we all came to run. We walked over to the start and waited for 8:00. We lined up just behind the starters because it didn't seem to be all that crowded near the front for some reason. 8:00 came and the race was off. We started off at a nice pace and it felt comfortable. I checked the watch and we were running just over 8 mph so I knew we were running a bit faster than I had anticipated. We came up on the first mile and Payton did a soft but heart felt "yea!" I looked down at the watch and it said 7:22, that is the fastest mile she has ever run. I was a bit worried at that point that I had taken her out too fast and that we would be paying for it before too long. We got to the half way point and she started to fade. She asked if we could slow down a bit when we got to a "corner" and I said sure. I wasn't expecting her to slow down as much as she did though and had to talk her back into speeding back up at least a little bit. The second mile marker came and the watch told us it was a 7:58. From this point in she was begging to stop and actually did stop one time. It hurt me as a dad to see her hurt, but I have watched her run, and have run with her enough to know she was OK, but just feeling the pain of racing. Being that she is currently training for Cross Country and running with her team I know she will be racing before too long and needs to know that she needs to keep going, and not give up, even when it is hard. During the last entire mile I ran just in front of her, constantly turning around and cheering her on and telling her to keep it up. I was not her favorite person in the world at that time I am sure. We finally were emerging from the neighborhood which meant we only had about 1k left, I was telling her to turn it on, that we were almost done. She wasn't listening to me, or she just thought she didn't have anything left, when a face I have seen at many of the races around here started to catch up with us. This is an older gentleman and one of the premier runners in the Run and See Georgia Grand Prix Series. He started cheering her on as well and telling her to keep going and to stay strong. She then kicked it in and we started moving at a great pace. The three mile marker came and Will Chamberlin from Classic Race Services was reading off the time. According to my watch our third mile was 8:24. Once we passed that point she stopped. I said, "what are you doing?" She said "we are done" and I said, "no we have to finish at the finish line up around the corner." She then let out a groan but started to run again. We came around the corner and I saw the clock. The clock was reading 24:40 and I had a secret (to her - but not my Twitter Friends) goal of sub 25:00. I once again cheered her on and said we have to beat 25:00 minutes! We ran it in hard and crossed the finish line at 24:50 with 10 seconds to spare, an 8:00 mile pace exactly. They gave me the #32 finisher card and I promptly handed it to the one that finished in front of me :) and I took the #33 finisher card. We filled out our cards and turned them in. It looked promising that both of us placed in our age groups. You can see us coming in hard in the picture to the left. The full splits can be seen on my running log. 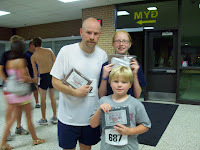 The award time came and Payton had placed first in her age group and I placed second in my age group. The net result of the evening was three runners and three awards - talk about a fun, exciting family evening. 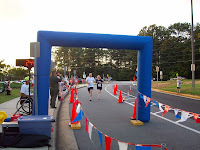 The official race results are not yet posted, as well as Don McClellan's Photos (which I am told I will have a big part in this year), but I will be posting a link to them as soon as they are available. If you want to know when these are added just leave a comment and check the box to be notified when additional comments are posted. Don McClellan's Photoshow - check this out - I am now a star! Official Results - long time coming - but finally up! Thanks for such an enjoyable post. It took me back to when my family was young and we all ran together. Nice to see the family togetherness. Great to hear that a good time was had by all! And very glad that there were no further mishaps! Congratulations on a well run race! Congrats on the great finish by all! Hardware all around! Nice job!! Sounds like a terrific event, and congrats to you and your kids for running so well! Also glad to hear the ankle is feeling better. I loved reading your race report. I think you are such an encouraging dad. Ready to push, yet patient. Great attitude with your son not getting first, some parents would have thrown a fit. Glad you all had a great day! Oh, and the man who gave your daughter a little encouragement, was spot on. Daughters won't always listen to their dad! Way to go Tim & kids! Sounds like a great time for all. Good job encouraging your kids, too. I'm sure you would have run much faster by yourself, but I commend you for pacing your daughter. I'm trying to convince my 10-yr old daughter to start running more this summer (she just finished a little after-school running club). Thanks all for the congrats and the kind remarks. A safe and very enjoyable evening. Still waiting on the official results and Picture show. Glad the ankle held up. Mine likes to tweak once in a while, & I have no idea what to do for it other than my chiro appointments. Congrats on an excellent race. Must be cool to run with family like that. Also a successful return to the scene of the crime must have felt pretty good. Thanks Joy and Chris for stopping by and the comments. Joy: I really never gave thought to a chiropractor - my wife and daughter go all the time, but I may need to go as well. P.S. I pass a spot where I had a bike wreck a couple of years ago on a regular basis. I ALWAYS pay homage to that little seam in the road! I love it that the race was a family affair. Congrats on everyone winning an award! Hey there! I work for a social media website (www.dneero.com) that is all about starting conversation. I noticed your interest in running, and thought you might like to check out this conversational survey regarding Base Performance Nutrition, Chris Lieto's line of sports nutrition products, and earn some for your time. Right now, we're trying to build a panel of runners and triathletes who are interested in collaborating and discussing various aspects of their common interest--this survey is just the beginning! We'd love and really appreciate your feedback. If you have any questions whatsoever, feel free to email me at daniel.pastan@dneero.com. Best of luck in your training! What a wonderful race report, and quite the family event! nice to have you stop by! 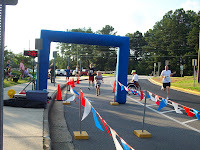 Hi Tim, I finally made it over to catch up on your blog this a.m. Love all the race photos and love seeing the GA race reports. I grew up in Athens and started running there as a student at UGA so many yrs ago. Will Chamberlain is a fixture in the Athens running scene and a friend of my Dad's. Very cool to see you mention him. He was doing the timing at the last race I did in GA last yr. Your transformation is so inspiring. So glad to follow your journey to 26.2! I want to thank the blogger very much not only for this post but also for his all previous efforts. I found blog.262quest.com to be greatly interesting. I will be coming back to blog.262quest.com for more information.